Overwhelmed By “PM-Bullish, Everything-Else Bearish” Topics! It’s 4:30 AM Saturday morning, and I doubt many other creatures are stirring in the Precious Metals blogosphere. As for me, I just scrolled through the seven pages of headline links accumulated in the past 48 hours alone – and frankly, I’m so “overwhelmed by PM-bullish, everything-else-bearish articles,” I’m having trouble choosing one to focus on. So instead, I’m going to “treat” you to a list format; which, when it’s done, I anticipate to be in the double-digits. After which, if you haven’t yet considered PROTECTING YOURSELF from what’s coming – if “it” hasn’t already arrived at your nation of residence, I don’t know will. I’m sure you weren’t expecting this topic to be first – but then again, it wasn’t reported until late yesterday afternoon. Which is, that the inevitable GrExit crisis has become more imminent than ever – after Greek stocks and sovereign bonds plunged, on news that the European Commission won’t give another bailout to relieve Greece’s “explosive” debt unless it adheres to the austerity measures it has yet to adopt (which Greek citizens dramatically voted against in July 2015, only to be ignored by their traitorous, soon-to-collapse government); and that the EC’s fellow “Troika” member, the IMF, was “significantly more pessimistic” that a new bailout will occur. Which is exactly what I predicted at the time of said “OXI” vote, in putting Greece atop my list of potential “grey swans” to catalyze the “Big One” (ironically, India was second). To that end, if you want to know just how bad things are in Greece, listen to this interview with former Greek Finance Minister Yanis Varoufakis. I mean, Greece is so broke, its government required all businesses to pay their estimated 2017 income taxes, by December 2016! Thus, it’s only a matter of time before Greece defaults on its €500+ billion of debt – owed principally to European banks like Deutsche Bank, and the ECB itself. But don’t worry, as so long as the “Dow Jones Propaganda Average” is supported at nose-bleed levels, all’s well. I mean, there’s nothing to see in Italy, where this week’s Supreme Court ruling opened the door for early snap elections – prompting Italian sovereign bonds to plunge, on fears that the catastrophic “ItaLeave” scenario is a possible 2017 outcome. Or outgoing, disgraced French President Francois Hollande espousing his vehement belief that the Trump Administration poses grave risks for Europe. Or the IMF all but begging the ECB to continue its ultra-easy, hyper-inflationary monetary policy ad infinitum. Or Marine LePen’s principal completion in April’s French elections, Francois Fillon, being embroiled in newly emerging scandal. Or the proposal of broad “cash restriction” law, across the entire European Union. Or the potentially inflectionary Dutch election just six weeks away; followed by the French election six weeks later; the final Catalonian secession referendum five months after that; and the potentially cataclysmic German election one month later. Four years into Shinzo Abe’s second failed term as Japanese Prime Minister; and nearly four years into his hyper-inflationary “Abenomics” scheme (which was initially targeted to end in two); it was reported that Japan’s core 2016 inflation was negative, even after Abenomics catalyzed a 50% Yen plunge. Not that the cost of living has gone down a whit, for the “99%” of Japan’s rapidly aging population, of course; as apparently, no amount of inflation, no matter how it’s calculated, is “enough” for the Bank of Japan, which responded by increasing QE yet again yesterday – validating yet again, why I believe Japan will be the first “first world” nation to experience 21st century hyperinflation. To that end, is it a coincidence that Yen-priced gold is just 10% from its all-time high, whilst Japan has become the second most actively traded Bitcoin market? And oh yeah, did I mention that Japan’s official response to Trump’s cancelling U.S. participation in the Trans-Pacific Partnership, was to warn that it is considering a potentially dramatic re-escalation of U.S.-Japanese trade wars? Two weeks ago, I penned “5%, Nuff’ Said?” – in which, I espoused that the only scenario in which U.S. interest rates could rise materially above 2.5% would be if the “bond vigilantes” had finally awakened, irreversibly so, to the Fed’s relentlessly hyper-inflationary schemes. Which, per this article – of a topic I have been discussing for years – likely includes the covert purchasing of U.S. stocks; creating “off balance sheet” holdings perhaps rivaling that of its $4.5 trillion “on balance sheet” assets. To that end, after yesterday’s massively disappointing hard data reports – of GDP (up just 1.9% in the fourth quarter), durable goods orders (down 2.4% in December), and new home sales (down a whopping 10% in December); as opposed to the laughable post-Trump “soft data” – like hollow, and statistically insignificant “consumer confidence” surveys (purporting the highest level of “hope” in more than a decade) – interest rates promptly plunged. Yep, after attempting to rise above 2.5% Wednesday and Thursday – hence, the focus of Thursday’s “interest rate rubber hits the road” Audioblog – the ten-year bond yet again succumbed to economic reality; in again closing below said key psychological level. But don’t worry, so long as the PPT relentlessly supports the “Dow Jones Propaganda Average” at its HIGHEST-EVER VALUATION; amidst its LONGEST-EVER BULL RUN; what could possibly go wrong? 5.Regarding the punk GDP data – resulting in just 1.6% 2016 “growth” (in name only, as opposed to the contraction that occurred in the world of truthful accounting), Obama just left office as the only President in U.S. history to not have a single year of 3% GDP growth, despite his contention of how strong the economy is. To that end, take a guess why said growth was so much weaker than expected. Yes, because exports dramatically plunged – what a “coincidence,” just as the dollar surged – via the mythical “Trump-flation” meme that has not a chance of occurring. Which in turn, is why Trump delivered his thermonuclear currency war salvo last week, in claiming the dollar was “too strong”; thus, demonstrating why the Fed CANNOT raise interest rates materially, if at all. 6.Trump’s “Executive Order” to build a wall across the Mexican border was all but guaranteed when Congress set aside the funds, creating a firestorm of angry exchanges with Mexico’s President, Pena Nieto. This wall, irrespective of who pays for it, symbolizes America’s plunge into a protectionist shell, which undoubtedly will cause more harm than good. Starting with, oh yeah, a massive increase in U.S. consumer prices, particularly if the 20%-35% “border adjustment tax” Trump has proposed is enacted, on essentially all imported goods. And particularly, those from Mexico, which just happens to be America’s largest supplier of silver. Which, like gold, is suffering from significant supply constraints that will only make it more expensive to obtain if said “border adjustment tax” is in fact implemented. 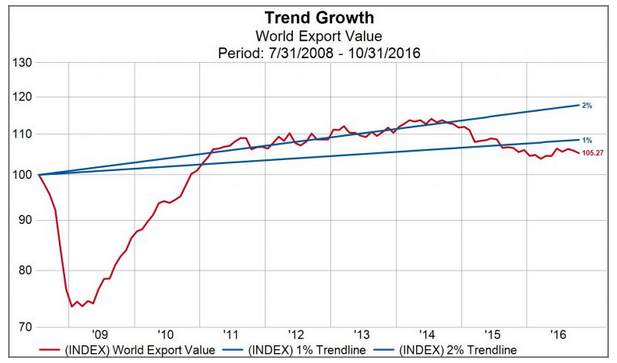 7.As exemplified by the punk GDP report, global trade continues to plunge, having peaked nearly three years ago. The strong dollar – caused by political and economic fear; and the Fed’s insanely suicidal “hawkishness” – is quite obviously choking off American growth (not that a weak currency is “good”); and causing worldwide currency collapses that threaten to catalyze massive bond defaults. Which in turn, are causing foreign Central banks to sell off U.S. Treasuries en masse to staunch the bleeding, whilst instituting debilitating capital controls. Which in turn, puts heightened pressure on the Fed to overtly re-launch QE – even if, per above (and my October 2014 article, the “End of QE – LOL) they are covertly doing so hand over fist. Gee, I wonder if Trump’s – and Steve Mnuchin’s – comments about the dollar being “too strong” will be followed by Federal Reserve; and Congressional; action. 8. Speaking of suicidal Congressional action, no one better puts the upcoming “fiscal bloodbath” into context better than David Stockman – in this scathing article, titled “run, don’t walk – this sucker’s going down.” With the end of the “debt ceiling suspension” just six weeks away, America is heading full-bore into a government shutdown scenario that makes the 2011 and 2013 episodes appear pale by comparison. To wit, not only does Trump desire a completely unfunded trillion dollar fiscal spending expansion, but tax cuts as well – yielding the potential for annual deficits that are already above a trillion dollars (if real accounting was utilized) to utterly skyrocket. Throw in yesterday’s “executive order” to dramatically expand the military – despite it already being, BY FAR, the world’s largest – and we’re talking about the potential for an historic political showdown between Democrats and Republicans that hate each other like the Hatfields and McCoys; and both hate Donald Trump. But don’t worry, the PPT-supported “Dow Jones Propaganda Average” just hit 20,000, so all’s well! 9. The ticking time bomb that is OPEC’s fictional “production cut” grows louder each week; as between growing concerns about compliance, and surging production from all nations not included in the agreement, it won’t be long before the investment community realizes that the historic, irreversible, global oil glut is not improving any time soon. Just watching the utterly massive increases in U.S. rig counts, shale oil production, and crude and gasoline inventories should tell you all you need to know about how much “control” OPEC has; and thus, how close we are to the “breaking point,” when prices plunge back below $50/bbl for good. In turn, unleashing the most violent wave of corporate and sovereign bankruptcies and debt defaults since the 2008 financial crisis. 10. Last but not least, the Precious Metal markets themselves; which, care of the inexorable destruction of fiat currencies by Central banks; and confidence in the monetary system in general, via the increasingly desperate actions of increasingly desperate governments, to maintain the dying status quo at the expense of the “99%.” Worldwide physical demand continues to surge – particularly in China; whilst, per above, supply continues to inexorably shrink. Thus, it’s just a matter of time before this “perfect storm” of potential supply shortage hits; likely, in my view, in 2017, given my expectation that it will be an historic year of money printing, draconian government actions, and monetary revolution. And when it does, it will be too late to protect yourself.